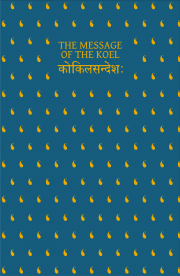 Description of "The Message of The Koel: Uddanda Sastri’s Kokila Sandesa"
'The Message of The Koel: Uddanda Sastri’s Kokila Sandesa' takes the reader on a tour of mediaeval southern India. A lovesick husband stranded in Kanchipuram dispatches a koel to his wife in central Kerala with a message to sustain her until he can return. The journey will take the koel across a lush landscape thickly carpeted in betel nut or cardamom trees and criss-crossed by rivers; to temples alive with myth; and into fabulous cities whose palaces push the stars out of their orbits. This is the first English translation of the 15th century poem. Shankar Rajaraman is a psychiatrist by profession who moonlights as a Sanskrit poet. Shankar is an ashtavadhani, having triumphed in several avadhanas or traditional poetry competitions in which the poet must compose complex verses on the spot in response to challenges thrown down by eight examiners. Venetia Kotamraju is a British Sanskrit enthusiast and the founder of Rasala, which publishes India’s most beautiful forgotten poems in translation. Reviews of "The Message of The Koel: Uddanda Sastri’s Kokila Sandesa"